Four swings made Dusty Rhodes famous. The pinch-hitting hero of the 1954 World Series, when the underdog New York Giants swept the Cleveland Indians, Rhodes delivered key hits in three of the four victories. And he never had to pay for another drink in New York. Rhodes played up his image as a country boy come to the big city and went along with stories about his drinking and carousing, up to a point. He maintained that Durocher exaggerated his after-hours adventures for their entertainment value. His major league career lasted just seven years. He never won a regular job because, according to Durocher, you could count on him to butcher at least one fly ball in the outfield every game. “I ain’t much of a fielder and I got a lousy arm,” Rhodes said, “but I sure do love to whack at that ball.”2 For a single triumphant season, he was a devastating hitter, and for three autumn days Dusty Rhodes was king of the baseball world. James Lamar Rhodes was born in Mathews, Alabama, near Montgomery, on May 13, 1927, one of eight children of Walter C. Rhodes, a farmer, and the former Annie Cawthon. The only thing certain about his childhood is that the family was poor. A Montgomery grocer, Fred Noland, took the boy in and gave him a job when he was about 15. Jim cited Noland as a major influence in his life. He joined the navy shortly after his 17th birthday and saw action in the Pacific in the final year of World War II. After his discharge in 1946, he played semipro ball around Montgomery, where he met and married Mae Ellen Childers. A scout for the Southern Association Nashville Vols, Bruce Hayes, first spotted him when he hit a home run barefooted. Jim hadn’t planned to play that day and left his spikes at home. Since he was under-age, one of his friends signed his mother’s name on the contract Hayes offered. Hayes gave him the nickname “Dusty” because all ballplayers named Rhodes were called Dusty.3 Two others were playing in the minors at the same time. Rhodes’s next stop was Class-B Rock Hill, South Carolina, where he liked the people and the fishing well enough to make it his offseason home. In 1951 he tore up the Tri-State League with 31 homers and a .344 batting average, but the Cubs sold him to Nashville after the season. His hot hitting continued in Double A in 1952, with 18 home runs and a .347 average before the Giants bought his contract in July. The Giants were fresh from “The Miracle of Coogan’s Bluff” that brought them the 1951 National League pennant, but their outfield was a mess. Center fielder Willie Mays had been drafted into the army, and left fielder Monte Irvin broke an ankle in spring training. By midseason the Giants had fallen 5½ games behind first-place Brooklyn. Rhodes arrived just in time to hear a clubhouse tirade by manager Durocher. Durocher put the 25-year-old into the lineup in left field. Rhodes responded with eight hits in his first five games on a road trip, then went home to the Polo Grounds, where the short right-field wall was an invitation for his left-handed swing. He slammed eight homers in his first 11 games in front of New York fans. Rhodes instantly became a fan favorite. He ran full-tilt to first base on routine ground balls, and once scored the winning run against the Dodgers by dashing home from second on a high bouncer off the plate that was fielded by the pitcher.5 Although his bat cooled, he finished with an .817 OPS, but committed nine errors in just 56 outfield games. The Sporting News chose him for its rookie all-star team. Irvin recovered in 1953 to reclaim left field, relegating Rhodes to pinch-hitting. He was not much good, going 6-for-39 (.154) in his first two seasons. He went into the lineup in August when Irvin injured a foot, and got hot. On August 26 he hit three consecutive home runs in one game against the Cardinals, two of them off left-handed pitchers. In 29 games as Irvin’s replacement, he racked up a .924 OPS. After the season the Giants took off for a barnstorming tour of Japan. Rhodes was the hitting sensation on the trip, but it wasn’t his bat that saved his job. No matter what he did against Japanese competition, Durocher was determined to get rid of the defensively suspect, bourbon-swilling outfielder. The manager had run into Rhodes in the Tokyo hotel lobby one morning, “just barely able to stand” after a hard night. Rhodes explained that he had been visiting his sister. Willie Mays came back from the army in 1954. After a quiet first month, he began to hit like Willie Mays. By July 4 he was batting .327 with 25 homers, and the Giants stood atop the standings, four games ahead of Brooklyn. Rhodes finally got into the lineup on July 4 and homered in each of his first two starts. He went into a left-field platoon with the slumping Irvin. On July 28 he homered three times in one game, again off the Cardinals. A month later he tortured the Cardinals yet again with two home runs, two triples, and two doubles in a doubleheader. The next day St. Louis manager Eddie Stanky intentionally walked Hank Thompson to pitch to Rhodes. The Cardinal killer delivered a two-run single. When he reached first base, he tipped his cap to Stanky. The Giants had taken over first place in June and held it until the end, finishing 97-57. Durocher always called the 1954 club his favorite of all those he managed, but he didn’t think he had a chance in the World Series. The Cleveland Indians had won an American League-record 111 games and knocked off the Yankees, winners of five straight Series. Cleveland’s Big Three starting pitchers —Mike Garcia, Bob Lemon, and Early Wynn — ranked first, third, and fourth in ERA. Game One went into extra innings tied, 2-2. Mays kept it that way with The Catch, his over-the-shoulder grab of Vic Wertz’s towering drive in the 8th. “When Willie made that catch, it seemed like they died,” Rhodes remembered.9 But he was the one who nailed the coffin shut. Lemon, the Indians’ starter, still looked strong when he opened the bottom of the 10th with a strikeout. Then he walked Mays, and after Willie stole second, Lemon intentionally passed Hank Thompson. Durocher played the platoon advantage, sending Rhodes up to hit for Irvin. The next day Cleveland’s leadoff batter, Al Smith, opened the second game with a homer off New York’s ace, Johnny Antonelli. 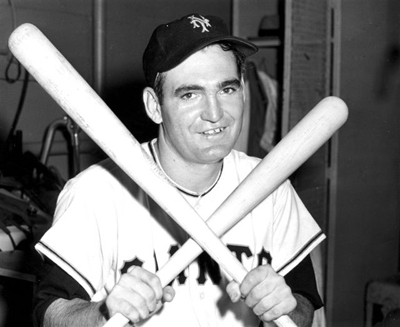 Early Wynn retired the first 12 Giants before Mays walked to lead off the fifth. Thompson followed with a single. With two on and none out, Durocher, a dedicated hunch player, called on Rhodes to hit for Irvin again. Wynn, living up to his reputation, knocked the pinch-hitter down with his first pitch. The count ran to a ball and two strikes, and then Rhodes dinked a blooper off the end of his bat that died in short center field, a single to chase home the tying run. Moments later the Giants took a 2-1 lead. The Series moved to Cleveland’s cavernous Municipal Stadium for Game Three. The Giants took a 1-0 lead against the third of the Indians’ aces, Mike Garcia. When they loaded the bases with one out in the third inning, Durocher went for the kill. Rhodes batted for Irvin. He cracked a sharp single to right to knock in two runs. It was his fourth consecutive hit, and he was batting 1.000 with seven RBIs. The Indians had seen enough; Rhodes drew an intentional walk in the fifth. Cleveland’s Ray Narleski ended the magic by striking him out in the seventh, and Don Mossi fanned him in the ninth. The Giants won, 6-2. The World Series hero basked in the cheers of his two hometowns, Rock Hill and Montgomery. One Rock Hill resident said Rhodes’s parade was “even bigger than when Santa Claus comes.”20 A Montgomery businessman sent a private plane to pick up Rhodes, his wife, and sons Dusty Jr., 6, and Ronnie, 4. At the Montgomery celebration he was presented with a new red Mercury. A local wine company hired him as a goodwill representative, and he moved his family back to Alabama. A winter of wining and dining didn’t hurt Rhodes’s batting eye. In 1955 he hit .305/.389/.449 in 217 plate appearances as a pinch-hitter and occasional left fielder. But his average fell to .217 in 1956 and .205 the following year. He didn’t get along with Bill Rigney, who had replaced Durocher as manager: “I was Durocher’s boy as far as he was concerned.”22 Dusty and Mae divorced, and he remarried in January 1958 to Mildred “Mimi” DeFoise of Brooklyn. They had a son, Jeffrey, and a daughter, Helene. The Giants moved to San Francisco in 1958, but Rhodes didn’t make the trip. The club’s farm system harvested a trio of young outfielders: Willie Kirkland, Leon Wagner, and Felipe Alou. The 31-year-old Rhodes was cut during spring training, optioned to Triple-A Phoenix. Even a demotion couldn’t bring him down. “I loved it there,” he said.23 The perks included three road trips to Hawaii. Rhodes hit 25 homers and tied for the Pacific Coast League lead with 100 RBIs. That won him a return to the majors in 1959. Used exclusively as a pinch-hitter, he went 9-for-48 (.188) and struck out in his last big league at-bat on September 27. After two more years in Triple A, he retired at 35. He was soon gone from his second marriage, and in 1980 he married Gloria Turco, who owned a New York tavern. Five years later he quit drinking and smoking. “I thought in order to have fun you have to be about half-crocked,” he said. “But after I quit I learned you don’t have to be loaded.”28 He and Gloria retired to Boca Raton, Florida, and later moved to Henderson, Nevada, near Las Vegas. In 2003 Rhodes told an interviewer, “I’m 76 years old May 13, but I forgot to go to bed for 30 years [so] I’m about 140 years old.”29 Suffering from diabetes and heart trouble, he complained, “I was never sick a day in my life until I quit drinking.”30 Rhodes died at 82 of heart failure on June 17, 2009. Good, Paul. “Dusty Rhodes #— Wonder of World Series.” New York World-Telegram & Sun, October 1, 1954. Wancho, Joseph, ed. Pitching to the Pennant: The 1954 Cleveland Indians. Lincoln: University of Nebraska Press, 2014. Weber, Bruce. “Dusty Rhodes, Star Pinch-Hitter in ’54 Series, Dies.” New York Times, June 19, 2009. 1 Phil Elderkin, “Leo Durocher travels down memory lane, with a stop at Dusty Rhodes,” Christian Science Monitor, June 19, 1985: 18. 2 Will Grimsley, “Introducing Mr. Dusty Rhodes, Pinup Boy of New York Giants,” Associated Press-Florence (South Carolina) Morning News, October 1, 1954: 15. 3 Dusty Rhodes, interview by Rick Swift, May 20, 2003. SABR Oral History Committee collection. 4 Barney Kremenko, “Dusty Made Major Impression Learning Know-How in Minors” New York Journal-American, October 6, 1954: 25. 5 The game was August 5, 1952, a 7-6 victory over Brooklyn in 15 innings. 6 Leo Durocher with Ed Linn, Nice Guys Finish Last (New York: Simon & Schuster, 1975), 260-261. 7 Joe King, “Dusty, Battling to Save Job, Saves Games with his Hits,” The Sporting News, July 14, 1954: 2. 11 Bill Madden, “Dusty Rhodes, hero of Giants’ ’54 World Series, hits high notes,” New York Daily News, December 20, 2008, in Rhodes’s file at the National Baseball Hall of Fame library, Cooperstown, New York. 12 Ira Berkow, “Rhodes Recalls Glory,” New York Times, October 20, 1981: A26. 18 Kevin Baxter, “Dusty Rhodes Dies at 82; Pinch-Hitting Hero of ’54 World Series,” Los Angeles Times, June 19, 2009, in HOF file; Rhodes interview. 19 Paul Dickson, Leo Durocher, Baseball’s Prodigal Son (New York: Bloomsbury, 2017), 218. 20 Jim Anderson, “35,000 Honor Dusty Rhodes,” Greenville (South Carolina) News, October 7, 1954: 1. 21 Pete Coutros, “It’s never too late for Dusty,” New York Post, July 14, 1989: 88. 26 Wells Twombly, “Now the 10th Man,” New York Times Magazine, April 1, 1973: 26. 27 Jere Hester, “Mr. October,” New York, October 23, 1989: 46. 31 Associated Press, “Former Giant Dusty Rhodes Dead at 82,” Desert Sun (Palm Springs, California), June 19, 2009: 24.